This thread seemed to peter out without an ending (like a lot of the ones I start on rules ) so a simple question - I'd like to enter a clusterbot in the AWS made up of an 130g roller and a 34g walker. Would anyone object to this not being in the rules? 2o) Where a clusterbot is composed of a rotary and a walking/shuffling botlet, then each botlet is allowed up to half the maximum of its class (e.g. an antweight cluster might be composed of a roller weighing 75g and a walker weighing 113g). Now it may be argued that the rule is badly worded, does not take account of more than 2 robots in a cluster, etc. BUT the rule is explicit in that the split must be 75g/113g. This clearly needs to be discussed at the AWS, but for AWS36 rules 4.1 stand. No, I agree really Gary. I always saw it as that way, but at the last AWS I was told by Andrew Hibbard and a few others that they see it as the other way discussed in this thread. I've fixed it anyway, I'm doing something else with it now to make it legal (will be a 150g 2 part cluster with 2 rollers). But yes, needs further discussion I think, even if I don't particularly want to bring it up, lol. I would agree the rule is badly worded and should be clarified. IMO if the walker was 30g I would accept it. If we agree that the way to go is to reduce the walker by 1/3 and then subtract that from 150 to give the weight left for the roller a simple graph can be used. 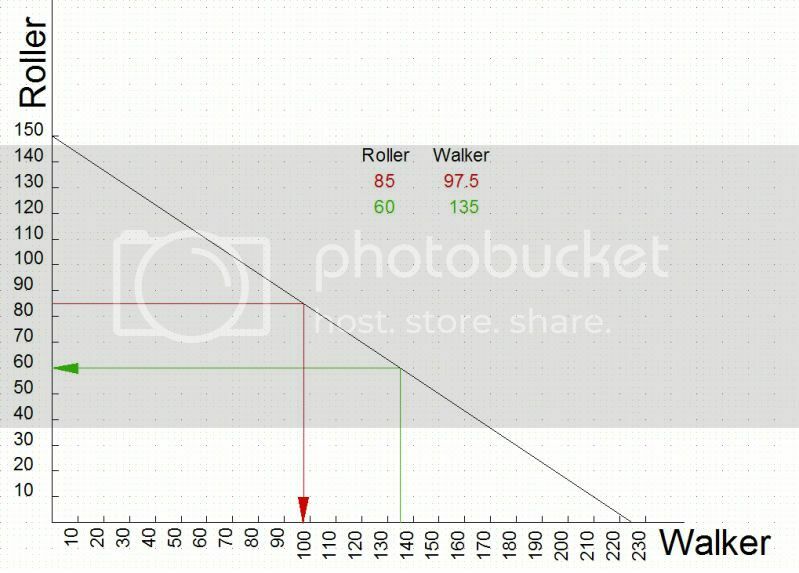 As you can see if you have a roller of 85 gms then you move horizontally from the 85 gms to the graph and then vertically down to get 97.5 left for the walker. Similarly if you have a walker of 135 gms you move upwards from the 135 to the graph then horizontally to get 60 gms for the roller. If there are more than two robots you just add say all the rollers together then find the total value left for all the walkers or visa versa. Looks good and fair to me Peter. I'd be happy to instigate it, although it'll have to be discussed and agreed on at the AWS. For this event, it'll have to be the current set of rules we use, as Gary says. But yeah, I'd be happy to use that graph. Makes it all very easy to understand. I have moved this discussion into the rules debate. The original rule is certainly limited in that it only considers a cluster of two robots. Also it appears to limit botlets in a mixed cluster to half the maximum weight, whereas no such restriction exists for all-roller (or all-walker) clusters. Do we agree that Peter's graph does what we want, allowing for clusters of more than two botlets in any combination? I don't really mind on this but wouldn't it be simpler to say that the whole cluster must weigh no more than 150g or 225g if one or more botlets is a walker? Then it doesn't matter what the weight distribution is or how many clusters there are. petec wrote: I don't really mind on this but wouldn't it be simpler to say that the whole cluster must weigh no more than 150g or 225g if one or more botlets is a walker? Then it doesn't matter what the weight distribution is or how many clusters there are. But you have a problem of a 150gram antweight and a 75g walker. There's no problem. You have a single combined weight. If you have a walker you can have up to 225g - your nominal 75g walker is likely to be uncompetitive in practice but if it is then someone is being clever in the rules...which is what we want. It must be a walker, though, not a stomp bot. So are you saying I can enter a 200g roller and a 25g walker then? I don't think that's being "clever" with the rules, just exploiting an obvious and undesirable loophole!